NEW DELHI: The Indian Coast Guard has released the Coast Guard Yantrik Admit Card 2019. 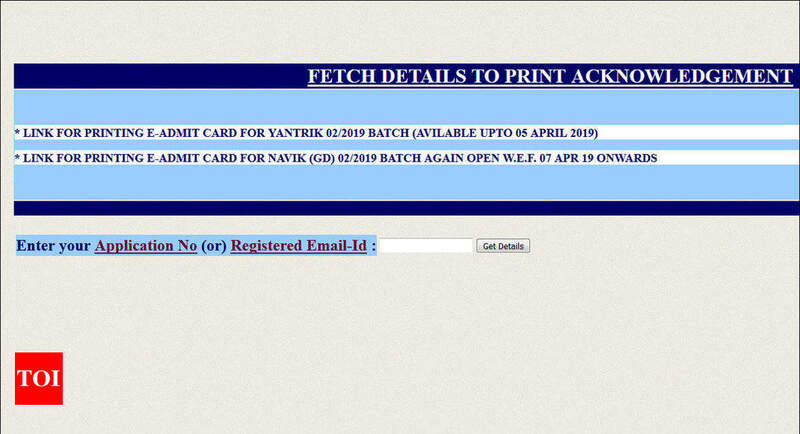 The Indian Coast Guard has released the Yantrik Admit Card for February 2019 batch. The Indian Coast Guard had invited applications from the Indian male candidates holding Diploma in Electrical /Mechanical/Electronics and Telecommunication for recruitment to the post of Yantrik for 02/2019 batch. Here is the direct link to download Indian Coast Gurad Yantrik Admit Card 2019 The candidates will be selected through written and physical efficiency tests, followed by medical examination. The Indian Coast Guard recruitment Centres are at Mumbai, Chennai, Kolkata, and Noida. Selection in Indian Coast Guard is fair and on merit basis. Candidate are advised not to fall prey to unscrupulous persons posing as recruitment agents. For complaint against such persons, agents candidate must approach the director (recruitment) coast guard headquarters, selection board, Noida on telephone – 0120-2414395.